FST Betting Insight - Are Midweek Fixtures Goal Fests? December kicked off with a bang in the Premier League this week. The first full schedule of midweek fixtures saw all 20 teams in the English top flight grab a goal, with 33 goals flying into the net in total on Tuesday and Wednesday. But how unusual is this? Well, very unusual as it turns out. Not since November 2010 has every Premier League team scored in the same round of fixtures, so it makes sense that the odds for a BTTS accumulator on every game in midweek hit over 400/1. 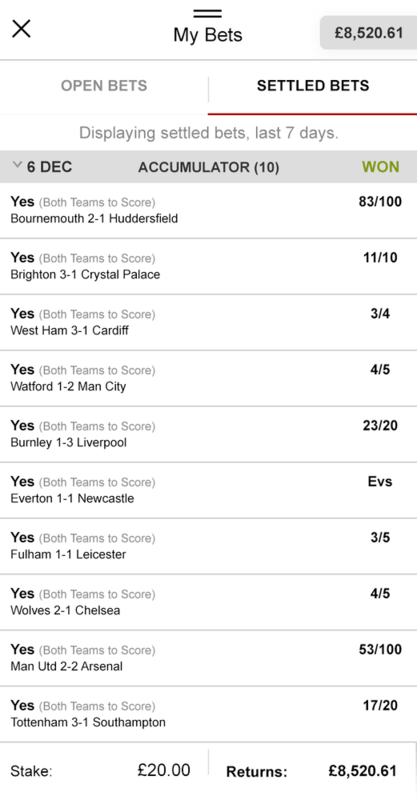 That didn’t detract one lucky punter though, who’s £20 stake on this rare feat has earned him a massive Christmas bonus. He certainly wasn’t the only one to enjoy an unexpected windfall either, with this bettor raking in almost £5k as well! Here at FST we like to leave no stone unturned, and the complete absence of midweek clean sheets set us thinking of a new angle to look out for in our betting research. In the NFL it’s a widely accepted opinion that short gameweeks and congested fixture lists tend to lead to higher scoring games. The coaches have less time to prepare the defensive side of their game in these situations, so it makes perfect sense. But can the same theory be translated over to football? We decided to find out. The first step in our betting research is to decide how much data we need to collect to make it a fair sample size. With around 50 midweek matches every season, we settled on a a sample size of three Premier League campaigns to give us a total of 159 midweek matches to look at since the start of the 2015/16 season. Next, we needed to determine a baseline figure to compare our findings with. How often do Premier League matches actually see both teams get on the scoresheet? Well, that was easy enough to find out, and an average figure over our three season period comes to 50.6% of the time, with Over 2.5 Goals landing a in marginally higher 52.6% of games. As you can see quite clearly, the midweek goalfest theory falls flat on it’s face. The BTTS and Over 2.5 Goals averages of 50.3% and 52.2% align almost perfectly with the overall Premier League averages for this period, so we can say with surety that backing extra goals based on the fixture being in midweek is not a promising betting strategy. However, as we mentioned before we like to turn every single stone with our betting research. So, what about the matches played after a midweek fixture list? This weekend’s Premier League schedule will see most teams take to the pitch for the third time in a week – A punishing and tiring prospect when playing at such a high level of intensity. It’s not exactly a massive leap, but there is something to work with here. The BTTS average rises to 52.6%, while the Over 2.5 Goals average makes a slightly larger leap up to nearly 56%. It’s far from a clear result, but it is something worth paying attention to when looking at this weekend’s Premier League matches. This particular dive into the numbers didn’t bring up anything major for us to use for our betting tips and predictions, but it’s this in depth analysis that helps us to bring you the best betting tips around. It’s resulted in us amassing a massive profit on Win Accumulators and Correct Score Doubles this season and let us uncover useful betting insights such as the truth behind the ‘New Manager Effect” and Manchester United’s strange two goal phenomenon. We don’t do things by half measures, and with this level of research going into all our betting tips and predictions you can be sure that you’re getting the best advice possible here. Oh, and in case you were wondering – There was a gap of 304 Premier League gameweeks between November 2010’s event of all top flight teams scoring and this most recent one. With odds as high as 444/1 being offered on all teams to score in midweek, if you had bet £10 on this outcome every single week since the last time it happened you would have made a profit of £1,400 in the end! You can find all of our BTTS tips and predictions here, and don’t worry – It isn’t based on whether the teams played in midweek or not! Categories: Betting Strategy, Football, Free Tips, and Premier League. Tags: betting research, betting strategy, btts, goals, midweek, over 2.5, Premier League, and premier league betting. League: England Premier League. Sports: Football.